Ten years ago, Jon Kabat-Zinn changed the way we thought about awareness in everyday life with his now-classic introduction to mindfulness, Wherever You Go, There You Are. Now, with Coming to Our Senses, he provides the definitive book for our time on the connection between mindfulness and our physical and spiritual wellbeing. With scientific rigor, poetic deftness, and compelling personal stories, Jon Kabat-Zinn examines the mysteries and marvels of our minds and bodies, describing simple, intuitive ways in which we can come to a deeper understanding, through our senses, of our beauty, our genius, and our life path in a complicated, fear-driven, and rapidly changing world. 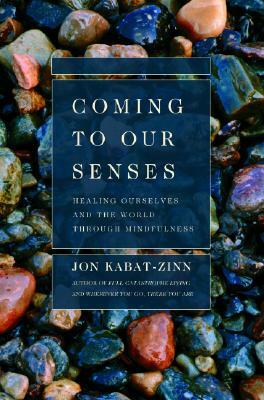 In each of the book's eight parts, Jon Kabat-Zinn explores another facet of the great adventure of healing ourselves--and our world--through mindful awareness, with a focus on the "sensescapes" of our lives and how a more intentional awareness of the senses, including the human mind itself, allows us to live more fully and more authentically. By "coming to our senses"--both literally and metaphorically by opening to our innate connectedness with the world around us and within us--we can become more compassionate, more embodied, more aware human beings, and in the process, contribute to the healing of the body politic as well as our own lives in ways both little and big. Jon Kabat-Zinn is the founder and former director of the Stress Reduction Clinic at the University of Massachusetts Medical Center. He also travels across the country teaching workshops on stress reduction and mindfulness. He lives with his family in Lexington, MA.